spinCycle is a synesthetic turntable that allows you to arrange and play colors visually and musically. spinCycle is fitted with a camera that takes the place of tonearm on a normal turntable. Rather than a needle playing grooves in a record, spinCycle creates sounds based on colors that the camera sees. The DJ places brightly colored plexiglass circles on the spinning platter, creating beautiful color patterns that are then translated into sounds. The DJ can rearrange the discs at any time, thereby creating a new soundtrack on the fly. spinCycle also captures the colors the camera sees and can either project them on a wall or display them on a computer monitor. This hypnotic display changes as the music changes, providing a fun synchronized multimedia experience. 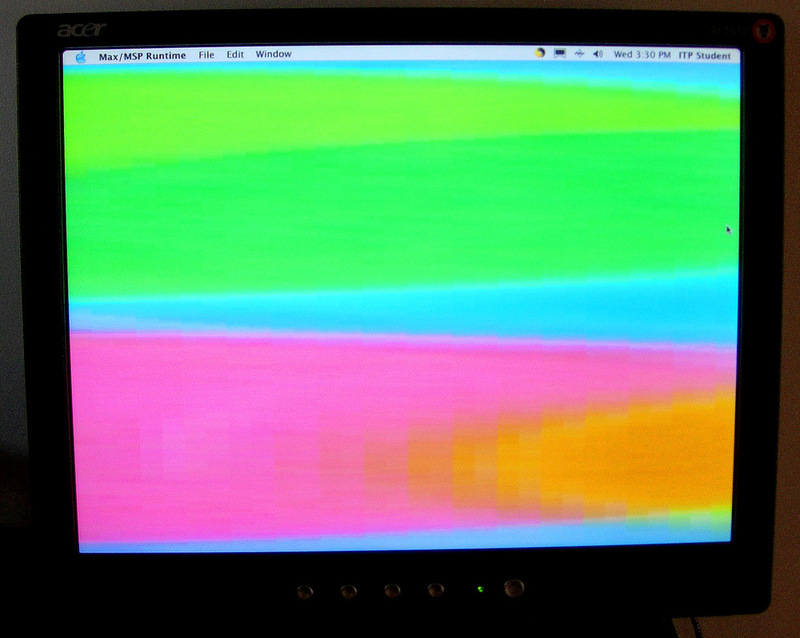 Max/MSP/Jitter is used to do the color-tracking and sound reproduction. Future versions will use a color sensor rather than a web camera, and sound will be emitted from the built-in speaker using tones generated by a microcontroller. For more information, download the NIME paper. spinCycle was featured in a performance on May 4th, 2005 at Tonic in the Lower East Side of Manhattan. spinCycle was installed June - December 2005 at NYU's Interactive Telecommunication Program, at the Sony Wonder Technology Lab in November 2005 and was recently on display at IRCAM as part of the NIME 2006 / Festival Agora Résonances 2006. Click on the bottom picture for a demo video.